Multiplayer in Ghosts like Black Ops 1 or 2? Will you have to work toward levelling up your weapons as in Black Ops 2 or will you simply be like Black Ops 1 where you are given money to buy weapons instead? Re: Multiplayer in Ghosts like Black Ops 1 or 2? It isn't clear yet, but it looks like you will be earning Squad Points in this game, which can then be used to Purchase weapons and gear for each soldier in your squad. 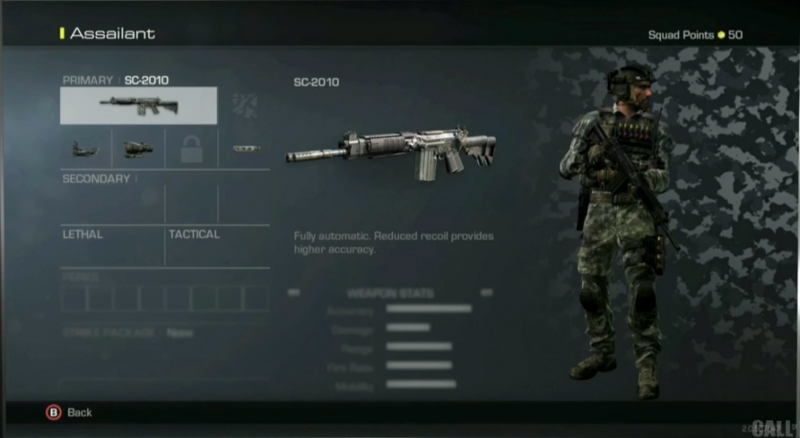 In Ghosts, you’re allocated a budget for our primary weapon, secondary weapon, your lethal & tactical equipment, and your Perks. All attachments and Killstreaks are free for you to choose. I agree. I loved Black Ops. My one issue with that game was it was way too easy to unlock things. Me? I like working towards things. But with my playing time severely limited these days.... I may appreciate being able to just purchase what I want, when I want.